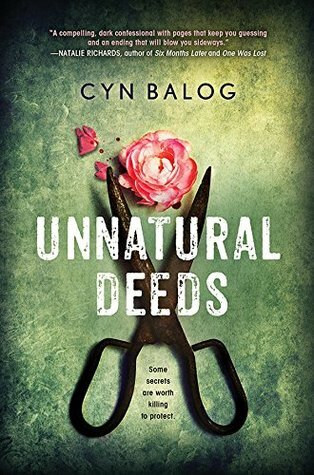 Unnatural Deeds has all of the things I usually like in a novel: an unreliable narrator, mystery and a huge twist that left me genuinely surprised. But, for some reason, this read was just so-so for me. It was a middle of the road novel that months later I have trouble remembering. Which, I think, speaks volumes. This novel centers around Victoria Zell. She is detached, has mental health issues, and somehow attracts the new boy at school. I know what you’re thinking, very tropey. This novel though uses the tropes to its advantage and the ending is not at all what you would expect. The ending is seriously the best part about this book. I think the root of why this novel was so “meh” to me was because I didn’t like or connect with Vic at all. As I kept reading all I could think was that she is the absolute worst. I never felt sorry for her, I never cared about her. Luckily, this novel is fairly short so spending an entire novel with her was bearable. Overall, this was a good book. Not a great or amazing book. It was just good. I enjoyed the quick pace, and loved the ending. But years from now I likely won’t remember this read. I've never read a Cyn Balog book. Now I might pick one up. Great review, Emily!